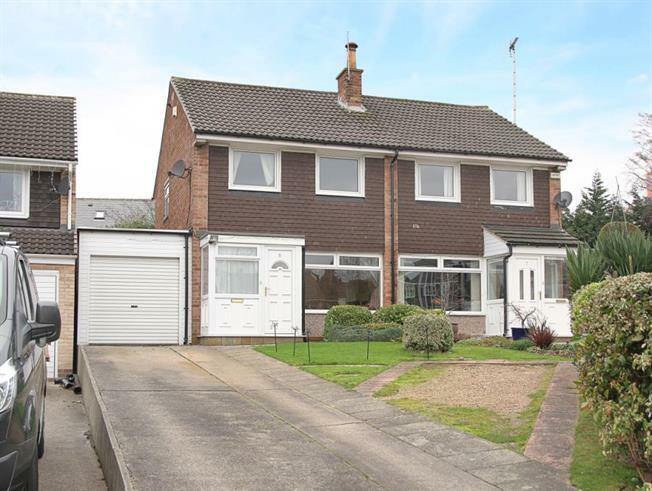 3 Bedroom Semi Detached House For Sale in Sheffield for £245,000. An excellent opportunity to acquire with no chain this well presented three bedroomed semi detached family home, occupying a cul-de-sac location in the heart of sought after Totley. Offering accommodation over two levels with the benefit of double glazing, GCH, garage, driveway, front and rear porches and useful utility room. Located in Totley which is a popular and sought after residential area with a host of excellent local amenities including shops, schools and regular public transport, Dore train station and the popular Abbeydale Park Sports Club. Within minutes of the open countryside of the Peak National Park and approximately five miles from Sheffield City Centre. The accommodation comprises an entrance porch opening to the lounge with open plan staircase to the first floor, wood effect flooring and living flame gas fire focal point, having French doors opening to the Kitchen and Dining room, the kitchen has a range of base and wall units in a shaker style with contrasting wood effect work surfacing having inset sink, integrated oven, hob and extractor with stainless splash back and further tiled splash backs, plumbing for dishwasher and space for fridge, having window overlooking the rear garden and doorway to the useful utility room having base and wall units with plumbing for washing machine, downstairs WC and door to rear porch. On the first floor the Master bedroom is carpeted with window to the front, bedroom two is carpeted with window to the rear, bedroom three offers flexible accommodation as bedroom, nursery or study, the bathroom has three piece suite in white comprising WC, wash basin and bath with shower over and screen. To the exterior of the property are gardens to the front, driveway provides off-road parking giving access to the garage. To the rear of the property is a garden area with patio and lawn providing an excellent outdoor seating and entertaining area.